Video projection, computational media, interactive media, laptop, wire and solder. 2014. Disrupted portrait considers how computational objects fashion our lived experience. The work explores how computer code interprets human faces by reverse engineering the 3D wireframe models used in computer vision. The wireframe facial portraits, used by image processing algorithms to detect human faces in public space are mimicked by an object, hand crafted to reference the materiality of code. 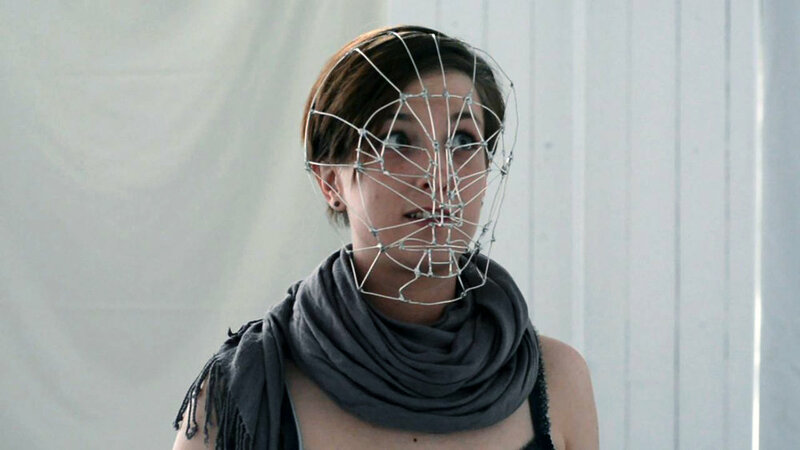 This wireframe mask can also be used as a tool of deflection to disrupt the facial detection code that inspired it. This tracking code is also present in the installation, manifesting as a video projection of bright lights which, once a face is recognised, follows it around. Participants can hide from the code by donning the mask, which makes the video projection disappear. The work explores how the advancement of computational activity affects the relations between things to consider how objects impact one another and the world at large.